Please note that GreenPower is currently only available for customers living in the U.S. or Canada. The first dietary supplement with Cannabid-ALL™, complete spectrum hemp organic extract powder, made using Extraordinary Extracts’ proprietary food grade organic solvent technology. This process extracts and concentrates the broadest range of hemp constituents including chlorophyll, sesquiterpenes, triterpenes, flavonoids and the full spectrum of hemp cannabinoids, with absolutely no harmful solvent residue. The hemp used is USA grown, non-GMO hemp and is also USA processed. GreenPower 20 is our most potent hemp extract product available, with a whopping 20 mg phytocannabinoids in each capsule, compared to 10 mg per capsule in GreenPower 10. GreenPower 20 maximizes the numerous benefits you receive from our unique extraction process. 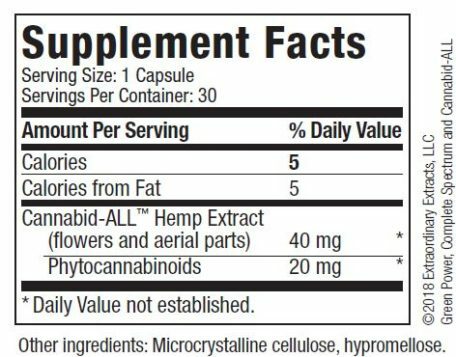 30 capsules of 40 mg Cannabid-ALL hemp flowers and aerial parts organic extract powder, with 20 mg phytocannabinoids.